Could you spare five minutes per day to get acquainted with some truly fascinating people and events? 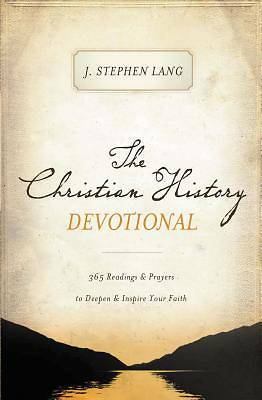 If so, you'll love The Christian History Devotional, where each day you'll learn more about your -spiritual family, - people who are as much a part of the rich Christian heritage as the people of the Bible. In these 365 vignettes you'll meet some names that will be familiar: Billy Graham, Martin Luther, C. S. Lewis, John Wesley, Mother Teresa, Francis of Assisi, Augustine, Corrie ten Boom. You'll also meet Christian athletes (Olympic runner Eric Liddell), scientists (George Washington Carver, Johannes Kepler), authors (G. K. Chesterton, John Milton, Anne Bradstreet), statesmen (William Gladstone, William Jennings Bryan), missionaries (Gladys Aylward, William Carey, Francis Xavier), evangelists (Billy Sunday, Dwight L. Moody, -Gypsy- Smith), artists (Rembrandt, Michelangelo), social reformers (William Wilberforce, Josephine Butler), soldiers (-Stonewall- Jackson, Oliver Cromwell), and many others, from the first century to the present, a diverse cast of truly amazing people. Turn to August 12, the day in 1973 when political -hatchet man- Chuck Colson gave his life to Christ. March 21, read about devout composer Johann Sebastian Bach, born on that date in 1685. April 1, learn about Communist-spy-turned-Christian Whittaker Chambers, born in 1901. October 15, meet evangelist Sam Jones, for whom the Ryman Auditorium (Grand Ole Opry) was built. October 31, discover what led Martin Luther to launch the Reformation in 1517. Whether you're a history buff or someone who always thought history was boring, here's a book to enlarge your spiritual family and teach you valuable lessons about life and faith. Here is history with a heart.